This device is attached to the teeth (but can be removed) by metal clasp or by other means to maintain the position of teeth. It is usually made of acrylic. It applies no force to move teeth. It is often used to maintain any correction of teeth. The reason is that muscles (tongue, lip, cheek) are used to a position of a tooth. When teeth are moved, the muscle will try to push back the teeth to its original position. The appliance is really training the muscles to accept the new position of the teeth. Usually by six months this “muscle force” is not present. The main disadvantage of this appliance is it relies on the person TO WEAR IT! 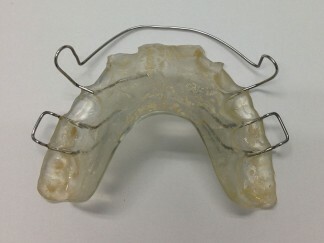 This is similar to the above appliance, except it contains elements that cause the teeth to move. These include various types of metal springs, bows, arms and special types of elastic bands. These elements need to be adjusted frequently to ensure the devices are still moving the teeth. Often once the active part of the treatment has been completed, the appliance can become passive by holding the position of the moved teeth. These appliances involve orthopaedic changes to shape and jaw relationship by modifying the environment around the teeth and jaw. This can be achieved by keeping muscles (cheek, tongue, lips) away from the teeth, with acrylic “bumpers”. Modifying jaw growth can be achieved by using joined upper and lower appliances to force the relationship of the jaws to grow into a preferred position. 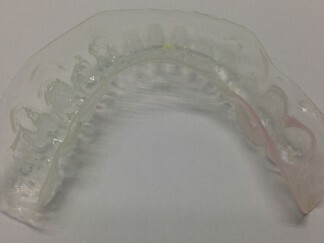 A series of custom made acrylic aligners that are used to gradually move the teeth. A new aligner is made once the teeth have moved based on an altered model of the teeth. The altered model is designed to put the teeth in the next point in the journey of moving the teeth to the preferred position.